Membership in the Coalition is free and is offered for both organizations and individuals! Members of the Inclusive Fitness Coalition include nationally recognized organizations in exercise, sports, fitness, and disability as well as industry leaders in areas such as exercise equipment, health promotion, parks and recreation and more. We welcome any organization to join IFC and support our efforts to promote inclusive opportunities in physical activity, health promotion, sport and recreation for people with disabilities. Click on the link to view our current Organizational Members. Follow this link to Join the Coalition. Individuals may also join the Inclusive Fitness Coalition as a Workgroup Member. We welcome any individual that has a passion and drive to support our unified effort. 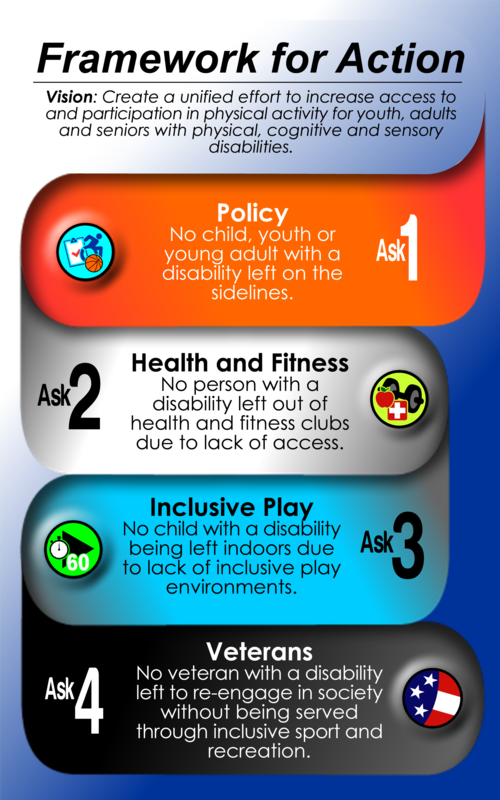 The Coalition currently has four Workgroups: Policy, Inclusive Play, Health and Fitness, Veterans. Take some time to read each Workgroup's strategic plan and determine your best fit. Follow this link to Join a Workgroup. Thank you for learning about the Inclusive Fitness Coalition's membership options. We hope that you get involved to make a difference today! For questions regarding membership, please send an email to incfit@lakeshore.org.